Replacement Artesian Spas Heater for $19.95 Free Freight Mfg Direct Why Pay Retail! Free advice how to replace your existing Artesian Spas control and heater. The industry's most efficient and reliable patented heater element with O-ring seals and without the troublesome bulkheads, epoxy, brazing or welding. This heater is built to last. Did you know? Our CosmoHeat Titanium Heater is Warranted 4¾ Years Longer than Balboa Direct, 4 Years Longer than Balboa Watergroup, and 3 Years Longer Than Therm Products! [Fig. ] Order this CosmoHeat from Table 1. Section : Replace your existing Balboa Heater with our Cosmoheat Heater and Manifold using a Pressure Switch in position 1 and Temp Sensor in position 4. [Fig. ] Order this CosmoHeat from Table 2. Section : Replace your existing Balboa Heater with our Cosmoheat Heater and Manifold using a Temp Sensor in position 1 and a Pressure Switch in position 3. [Fig. ] Order this CosmoHeat from Table 3. Section : Replace your existing Balboa Heater with our Cosmoheat Heater and Manifold. [Fig. ] Order this CosmoHeat from Table 4. The CosmoHeat is a spa heater that can be installed on most Balboa spa controls as well as Balboa M7 heaters. 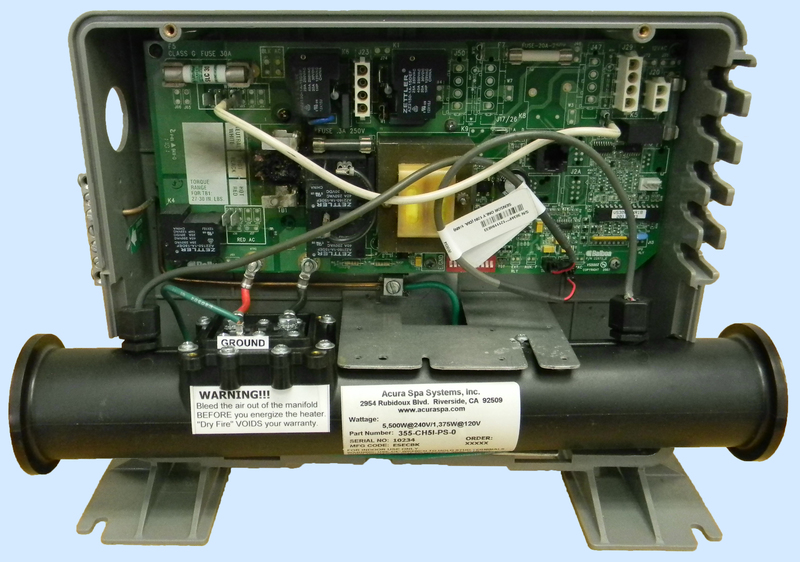 You may order our CosmoHeat and have your installer simply remove the old heater and manifold from your Balboa control and install the new CosmoHeat using our installation instructions. 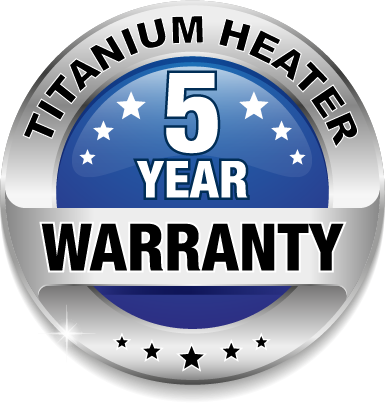 Our Titanium CosmoHeat comes with 5 years corrosion-resistance warranty. Please purchase and install our patented Automatic Airbleeder to protect your heater against heater dry-fire. We do not supply Balboa temp sensors or strain relief. Simply remove your old temp sensor(s) from your old Balboa heater manifold and install them on the new CosmoHeat hot tub heater manifold. The CosmoHeat hot tub heaters can be adapted to all Balboa hot tub heaters and manifolds usually used for portable spas and hot tubs known by part number: 58010 Balboa Heater, 58209 Balboa Heater, 58083 Balboa Heater, 58000 Balboa Heater, 58064 Balboa Heater, 58123 Balboa Heater, 55464 Balboa Heater, 58059 Balboa Heater, 58086 Balboa Heater, 58151 Balboa Heater, 58105 Balboa Heater, 55464 Balboa Heater, 58130 Balboa Heater, X300930 Balboa Heater. It can also replace Therm Products, part number C2550-0807-TPS. Balboa spa heaters manufacture, manufacture of balboa heater and parts. Balboa hot tub heaters and fits M7 technology. Polymer corrosion resistant manifold 2" x 15" Heater Assembly. 5.5 kW, 4.0 kW or 2.5 kW Heater Element wattages available. 2" Split Nuts and Slip Fittings can be purchased seperately if needed. We do not supply Balboa sensors number 32016 (or any other Balboa product number). We only sell what we produce. Operates on either 110V or 220V. If your plumbing is 1½" simply use a 2" to 1½" Reducer Bushing to change the plumbing on the heater from 2" to 1½". All Grounding wire connections must be supervised or performed by a licensed electrician to ensure proper ground connections from the heater to the Balboa control box to the main ground. Failure to properly ground can lead to electrocution. Acura Spa Systems, Inc. only warrants Acura Spa System's products. 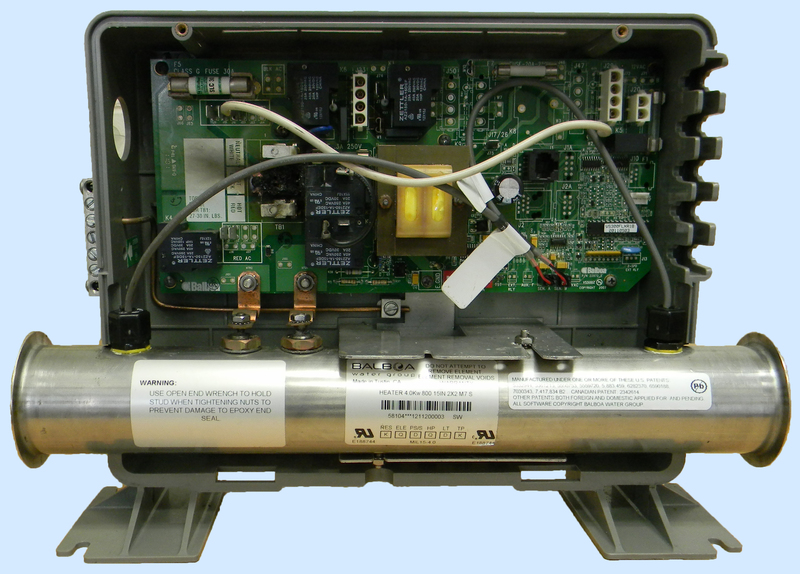 Acura Spa Systems, Inc. does not warranty any product installation and/or repair done outside of Acura Spa System's facilities. NOTE: Your Balboa Temperature Sensor WILL touch the Heater Element. This does not affect heating, temperature reading or grounding. This is not a problem in any way. Please refer to the drawing provided here to determine if your installer can properly adapt the CosmoHeat to your control box. Artesian Spas do not manufacture heater elements. Artesian Spas install spa controls made by Balboa Water Group or from Applied Computer Controls. The spa heater manifold and heater element are supplied as part of the Balboa electrical control box. The above shown heater elements for $19.95 are both direct replacements for all FLO Thru spa heater manifolds used on Balboa packs or ACC spa controls. All these heaters are part of Balboa controls, Smart Touch controls, Spa Builders Water Group, Spa components, ACC controls, United Spas controls, Gecko Spa controls. These heater manifolds are known as FLO Thru heater manifolds. This type of tubular heater is usually made out of material known as 800 Incoloy and annealed at 1990 degrees Fahrenheit. The heating element inside the tube is electricaly insulated from the tube by Magnesium Oxide (MgO). The outside of the tube is than braised, welded or sealed by epoxy to the bulk heads. The heater is then tested and must pass a 5 mA current leakage test to the water surrounding the tube. The manufacturing process is the same for any tubular material including Titanium, only the annealing temperature may vary. The heater manufactures are: TrueHeat, Chromalox, Heat Tube, Kawai, and CSINC (CSINC are made in India), etc. These heater manufactures will only produce based on volume. The heater manufactures sell to Balboa, ACC Controls, Thermcore, Gecko Spa Controls, Gecko Alliance, Spa Builders Water Group, Spa Components, United Spas, Acura Spa Systems, and others. These type of manifolds are also assembled by Thermcore products in San Bernardino, California and CSINC in India. CSINC usually private labels to some of the major spa control manufacturers in the hot tub industry. Spa Components is another heater manifold assembler. However Spa Components out source all stamping and welding of the manifold. Spa Components purchase the complete heating elements from heater manufactures and assemble them inside the heater manifold. This type of spa heaters is the most common heater elements used on most hot tubs. This type of heater element is designed to meet the lowest price mandated and influenced by marketing people in the hot tub industry. Usually the bulk heads are secured and sealed on this type of heaters fail due to the corrosive environments that exist in hot tub water. We do not recommend the use of this type of heater in salt water regardless of what the sales people might tell you. Even if the heater element is made out of Titanium or coated, the bulk heads and epoxy are still prone to failure. We never designed this type of spa heater. We only purchase these spa heaters and sell them as replacement parts. The Acura Spa Systems CosmoHeat, is designed without the troublesome and failure prone bulk heads. The CosmoHeat heater and manifold are engineered with a patented O ring seal system that is bulk head and epoxy free. Additionally, when the CosmoHeat is purchased with a new Universal Spa Control (with the optional titanium heater with AAB valve), it comes with an optional 5 year replacement warranty. Acura Spa Systems is providing another choice www.acuraspa.com/cosmoheat.html. Not all heaters are created equal. Direct manufacturer replacement for A.C.C. hot tub controls used on LifeSpas, Phoenix Spas, Artesian Spas, Diamente Spas, and Spa Mechanics.